This is a sponsored post of the app Hostelworld.com – it is sponsored in so much as it’s a paid for post. Our review and opinion of this app are not biased in anyway. Hostelworld allows you to search fast over 27,000 hostels in more than 180 countries and it comes packed with a huge array of user reviews to help you make a selection – this is hugely valuable. The app is simple and straightforward to use, just set up an account on via your email address and add a password and then log in and start searching and/or booking immediately. 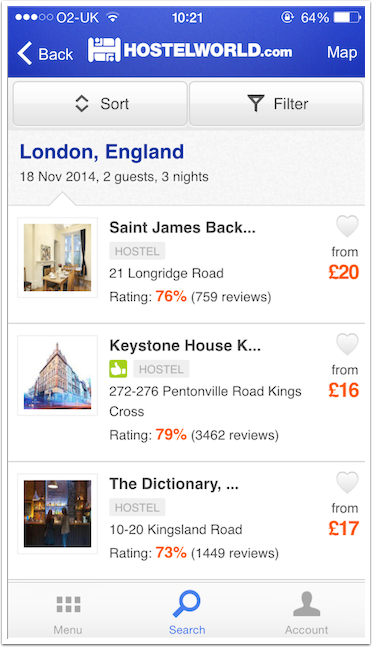 Hostelworld prompts you to search by city or property, just add the dates you’re looking for, the number of guests and nights you would like to stay. 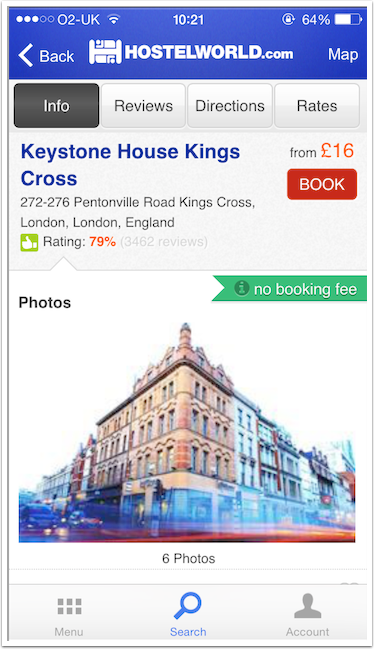 Hit Search and it will bring up a list of suitable hostels available. If one takes your fancy, just select it and view more details, such as the previous user reviews, facilities including information like wi-fi, hot showers, housekeeping etc. By selecting Rates, you’ll also be taken to a selection of room types available, for example, 8 bed mixed dorm or 16 bed mixed dorm. Once you’re happy your decision, just click on Book Now and you’ll be asked for a 12% deposit to secure your booking, there’s no booking fee if you book through the app. The balance is payable when you arrive at the property. To pay the deposit you will need to use a credit or debit card. The settings feature allows you to set the currency you would prefer to operate in as well as the distance units and language (it’s available in English, Spanish, French, German, Italian and Portugese). 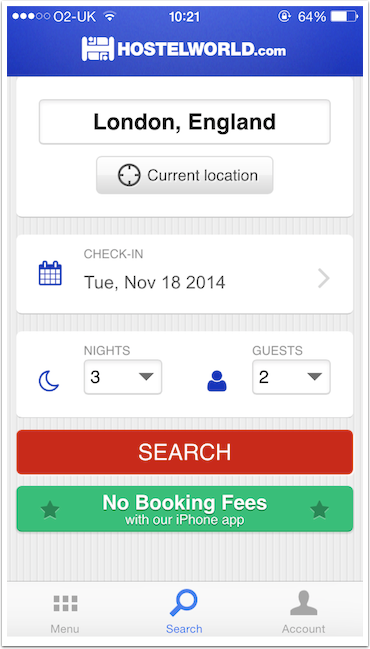 This is a very simple and efficient app to help you navigate hostels around the world whilst on your travels. A very useful tool to have with you.